Aston Martin Works has produced the first proof-of-concept model for its Heritage EV programme. The plan aims to future-proof the brand’s classic cars, mitigating the impact future emissions restrictions may have on them and allowing such cars to live on in zero-emission form should their combustion counterparts be outlawed. Classic cars are delicate machines and due to their increasing value, many owners would do anything to avoid permanent alteration of the original car, making a conventional electric conversion unappealing. As the reversible powertrain name suggests, however, this programme is different to others we have seen. It allows the car to retain as much of its original character as possible in its electric form, whilst also having the ability to fully revert back to its original combustion engine. 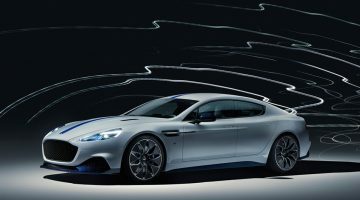 Devised by Aston Martin Works in Newport Pagnell, the reversible powertrain has been developed using knowledge acquired during the development of the Rapide E shown earlier this year. The first model the powertrain has been used on is an original 1970 DB6 MkII Volante, a car that was originally hand-crafted at Newport Pagnell where Aston Martin Works is now based. Although we’ve seen classic cars converted to full-electric power in recent years, the reversible, non-destructive aspect of this concept is what makes it unique. In order to have the ability to reinstate the car’s original powertrain if desired, the workings of the powertrain sit on the original engine and gearbox mountings, with the ‘cassette’ (battery) enclosed within its own self-contained cell. 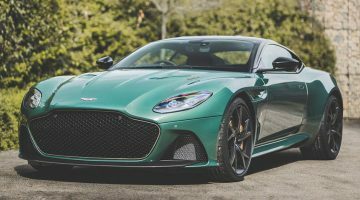 What Aston Martin describes as ‘Umbilical cords’ are then fed from the main power unit to drive the car’s electrical systems. A dedicated screen is also discreetly fitted to the car’s interior to allow the driver to manage all of the systems. Due to its ties to the Rapide E, key components from the model will be used in cars featuring the reversible powertrain. After building the proof-of-concept DB6 Volante, Aston Martin Works will be responsible for completing all customer Heritage EV conversions, expected to commence in 2019. With certain restoration projects from the division costing upwards of $640,000, we can’t imagine the conversion will come cheap, but it could be a very worthwhile modification to make.